Title Card: 1930. Prohibition has transformed Chicago into a City at War. Rival gangs compete for control of the city's billion dollar empire of illegal alcohol, enforcing their will with the hand grenade and tommy gun. It is the time of the Ganglords. It is the time of Al Capone. Reporter: [to Al Capone] An article, which I believe appeared in a newspaper, asked why, since you are, or it would seem that you are, in effect, the mayor of Chicago, you've not simply been appointed to that position. Courtesy of London Records, A division of PolyGram Classics, Inc.
Q: Why did Capone beat the guy to death with the bat? Q: What is the name of the song when Capone is at the opera? Director Brian De Palma is the son of a surgeon, and perhaps this explains his high tolerance for the bloodshed that has translated into brutal, raw scenes in 'The Untouchables'. Then again, this film is set during one of the bloodiest chapters of American history and demands unflinching depiction accordingly. Zooming in on prohibition-era Chicago, a dirty, dingy, crime-infested retreat of mafia, the film lets us know a special unit headed by Kevin Costner whose objective is to frame the super villain himself  Al Capone (Robert De Niro). 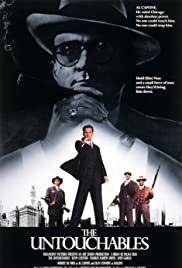 There are, in effect, three or four things that truly stand out about The Untouchablesan otherwise standard crime by-the-numbers rompand at least one of them should be attributed to the surface of the spectacle; the costumework and settings are superbly breathed life into, as is De Palma's accolade, with a screen that is awash with lyrical colours and accompanied by a swelly, jazzy moonlit music score. Another worthy accolade is of course Sean Connery as detective Malone  an American-Irish cop on the beat and down with the ways of the street  who may deliver one of the worst accents in film history, but makes up for what he lacks in verbal power with heaps of charisma. Malone is given, by far, the best dialogue in David Mamet's script as when he instructs Kevin Costner on how to get to Capone: "He puts one of yours in the hospital, you put one of his in the morgue." Another worthy staple to The Untouchables is its strong individual scenes. In the front row for these sits the notorious baseball bat scene in which a furious Al Capone beats one of his associates' head into a bloody pulp with a bat, right in front of all the guests at the grand dinner table. Robert De Niro gained weight for his role as the crime-lord Al Capone and approaches his character with commitment, but sadly he is ineffective in the film as De Palma does not quite know what to do with him. Instead he craggily intercuts Capone's boisterous speeches and monologues with the template storyline of Kevin Costner's special unit, and the former are incongruous to the key story of 'The Untouchables'. Here it regrettably becomes apparent that the film possesses all the necessary ingredients but no blender in which to stir it  and De Palma is largely to blame for lacking the necessary skill. 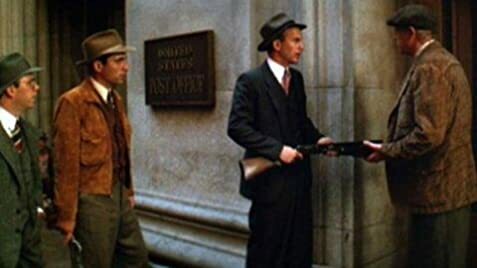 Having said that, The Untouchables keeps up the appearance of an epic crime film so rigorously through seamless costumes, stinky Chicago accents, vivid chases and a swarming taste to its sets that for a long time we are led to believe that De Palma has truly done it with this film. Certainly there are many scenes that testify to this and aptly camoflauge the shortcomings, such as the suspenseful pre-battle sequence at the Canadian border in which the Western-loving Costner is up on horseback to ambush the incoming shipment. Another is the first meeting between Andy Garcia and Sean Connery, in which the latter decides to recruit Garcia's Italian character in spite of racial feuding (Connery's supposed to be Irish), and instead because he likes his mouthy, bold attitude. Finally there is the unspeakably epic climax scene that plays on operatic in length through a long, glorious slow-motion capture by a staircase, politely nodding to The Battleship Potemkin's 'Odessa Steps Sequence'. The whole film is in fact an operatic affair with technicalities deluxe. With its mindboggling ensemble (Kevin Costner, Sean Connery, Robert De Niro, Andy Garcia and Patricia Clarkson) it is easy to see how it is cuing us in to like it. To some extent it succeeds well, for it is suspenseful, but it is not well sewn-together. What good is a De Niro if you are not going to use him opposite the rest? What good is a Kevin Costner (who has never looked so ridiculously handsome in his career for that matter) if you are not going to let him emote? And lastly, what good is a large handful of fully-fledged wonderful scenes if you are not going to juxtapose them with something, instead of dishing them out every now and then to keep our interest? 58 of 96 people found this review helpful. Was this review helpful to you?